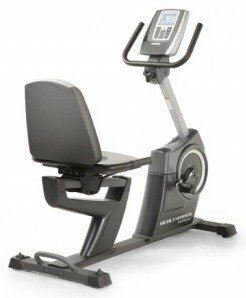 The HealthRider H35xr exercise bike is an Icon Fitness product with the same features as other cheap bikes in the Icon stable such as ProForm and NordicTrack. The console has a Grafixx™ Display that shows readouts for speed, time, distance, calories burned, and pulse. Along with 20 personal trainer workouts, focus on hill climbing or long-distance intervals. Check out the popular H35XR on sale now at Amazon! 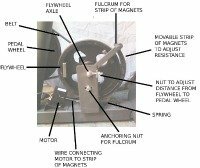 The HealthRider H35xr exercise bike comes with frictionless magnetic flywheel components, 16 resistance levels, a 300-lb max user weight capacity, handlebar grips for contact heart rate monitoring, a power adapter, and an iPod/MP3 player jack and speakers. The iFit Live™ technology requires a wireless adapter (sold separately) and a personal computer to access the internet. It does allow you access to download additional programs designed by pro trainer Jillian Michaels and some other cool features, but if all you want to do is to get on the bike and pedal the pounds off using a Manual mode, then this feature won’t appeal to you. 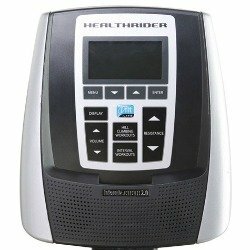 As HealthRider is an Icon Fitness brand, the H35xr has the same frame, components, specs, poor warranty, and hit-and-miss customer service as budget ProForm and NordicTrack exercise bikes. The consoles will be slightly different from sister brands, but the programs and other software are the same, only the label on the frame changes. 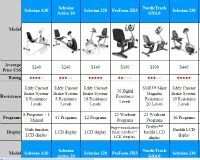 While the $399 HealthRider H35xr exercise bike may get some passable reviews, it is not the good deal that it seems. With a 90-day warranty, you will be tempted to buy the extended warranty (1-year for $90, 3 years for $149, etc.) which will add to the price significantly. For $399, you should go with the Horizon RC-30 Recumbent, which is a Johnson product (not Icon Fitness), and is covered by a 20-year brake, one-year wearable parts and labor warranty, as well as better components.